The global online multiplayer phenomenon World of Tanks first made its console debut five years ago today when it launched on Xbox 360. Today, World of Tanks: Mercenaries is also available on PlayStation®4 and Xbox One, and remains one of the biggest free-to-play console games in the world. Wargaming is pleased to announce that the game has now recruited over 18 million commanders, and to celebrate this milestone and the game’s anniversary, a series of special in-game events and prize giveaways are about to be deployed! The celebrations don’t end in-game – this is a real party, and we’re ready to dish out some real prizes! 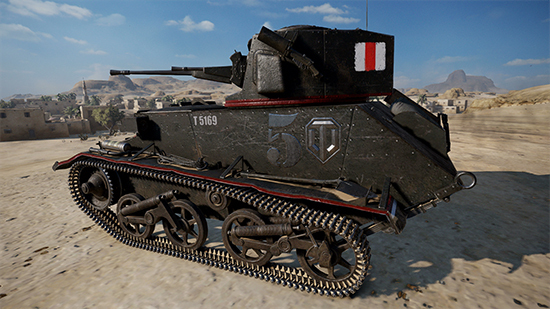 In partnership with Initial Games and Incredible Adventures, World of Tanks: Mercenaries is hosting its biggest prize giveaway ever this month, with over 6,500 physical prizes up for grabs. Starting February 12, players who visit the official website will be able to enter to win exclusive game merchandise, including custom jackets and backpacks, branded bottle openers, badges, medals, and even a one-of-a-kind custom PlayStation 4 or Xbox One X console. Five lucky winners will also be invited on an epic once-in-a-lifetime trip to drive tanks, crush cars, and get a taste of life as a real tank commander in Minnesota, USA this May!